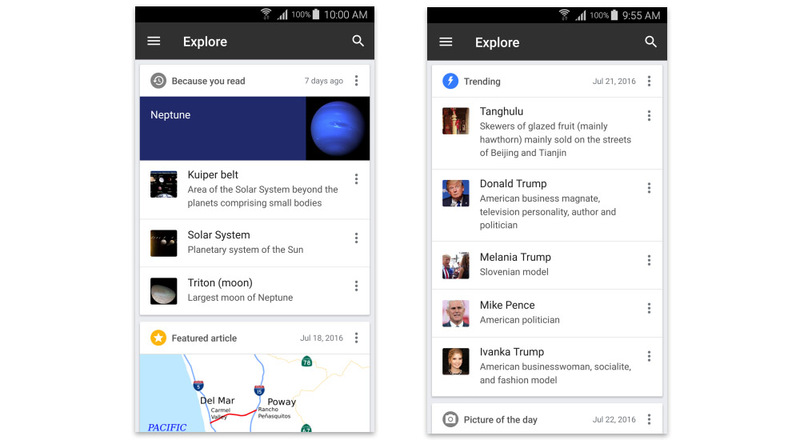 Wikipedia’s Android app is getting a major update today that introduces a redesigned Explore tab that will help you casually find out new interesting content in your free time. This new feed will show you recommend images, articles, news, and other bits based on previous reads. Trending articles: The top five most read articles of the day. Featured picture: A bold image selected every day by the Wikipedia editor community. Because you read: Recommended articles based on what you’ve read lately on Wikipedia. Continue reading: An option to continue reading articles that you started, but haven’t finished reading yet. Today on Wikipedia: This card takes you to the Main Page of the Wikipedia of your preferred language. Randomizer: A random Wikipedia article. A more prominent Search bar at the top of the feed, with integrated voice search. Outside of those items, Wikipedia says to expect to find previous day’s features and trending topics, quick sharing of items, swipeable cards to quickly remove those you aren’t interested in, and the option to save for offline reading.